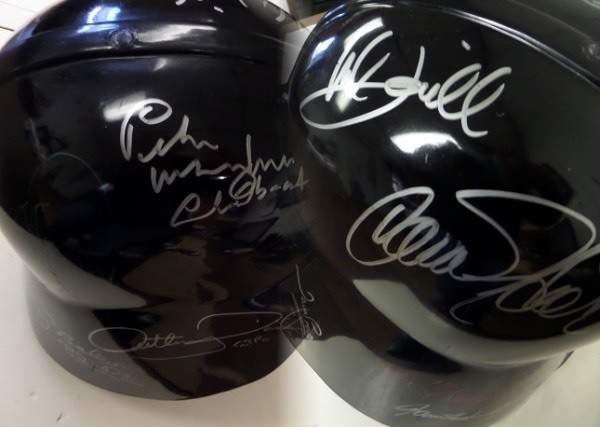 Coach's Corner - Star Wars ORIGINAL cast-signed/guaranteed Darth Vader mask by 11 STARS! Go Back to Lot List Star Wars ORIGINAL cast-signed/guaranteed Darth Vader mask by 11 STARS! This approx. 1.5 foot high Darth Vader mask can be worn and is MINT! It is all black and comes signed in various colored sharpies by 8 stars from the original hit movies! The autographs are all in superb shape and included are MARK HAMILL, HARRISON FORD, CARRIE FISHER, JAMES EARL JONES, BILLY DEE WILLIAMS, FRANK OZ, DAVE PROWSE, ANTHONY DANIELS, KENNY BAKER, PETER MAYHEW, & GEORGE LUCAS! a MUST for the Star Wars collector and BV into the thousands.